If you are considering remodeling your kitchen, but do not like what the big box stores offer in terms of cabinetry, let Castle Remodeling help! 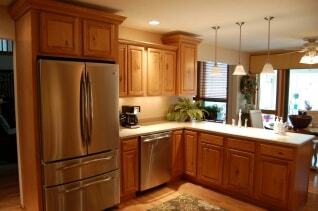 Our team offers custom kitchen cabinets, and we can design your cabinets according to your wishes and budget. We offer a variety of materials and colors from which you can choose, as well as designs and sizes so your cabinets fit within your kitchen seamlessly. Not only do we offer custom work, but also semi-custom cabinetry for quicker installation. Save on time & cost with our beautiful & easy to maintain Corastone products. We strive to build and install custom or semi custom kitchen cabinets that match your home and sense of style so you are more than satisfied with your cabinets. Even if you do not wish to completely remodel your kitchen, and would simply like new cabinets installed, our team can be of assistance! Please call us at (818) 991-0361 for more information regarding our Agoura Hills kitchen remodeling services.